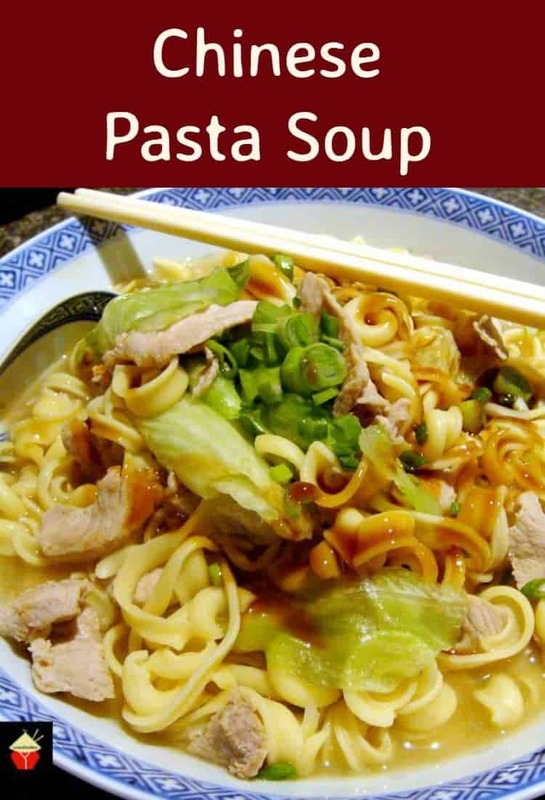 Easy Chinese Pasta Soup! When you’re in a hurry or you want something quick and easy to make, budget friendly and filling, then this is the recipe for you! 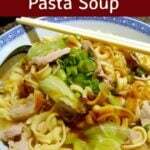 The ingredients are very flexible, and you can use a variety of vegetables, meat or tofu, and indeed, you can spread the dish out so it goes further, if you’re on a tight budget, by adding more pasta. Serve this as a lunch or dinner and your tummy and taste buds will be satisfied. I’ve done step by step photos so you can follow along, particularly if you’re a new cook, and for students, this is a great meal as it’s all in one pan, so washing up is minimal and it’s fuss free! Please note, I have not made this recipe particularly salty, however, when you are ready to serve, you can place the soy sauce and other suggested sauces at the table and everyone can help themselves according to taste. At the end of the recipe I have put some other ingredient suggestions which hopefully will inspire you to chop and change so you can vary the recipe each time you make it. Then it’s like ‘new’ every time! Please enjoy. 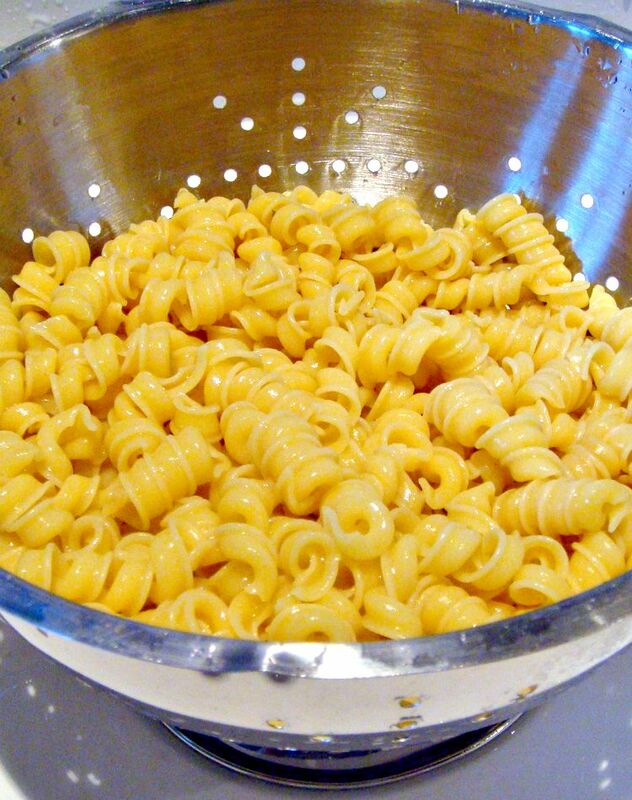 1 cup per person Pasta. Choose your favourite pasta shapes or noodles. Pinch White Ground White Pepper. 1. First, as with most Chinese dishes, you need to prepare all the ingredients. 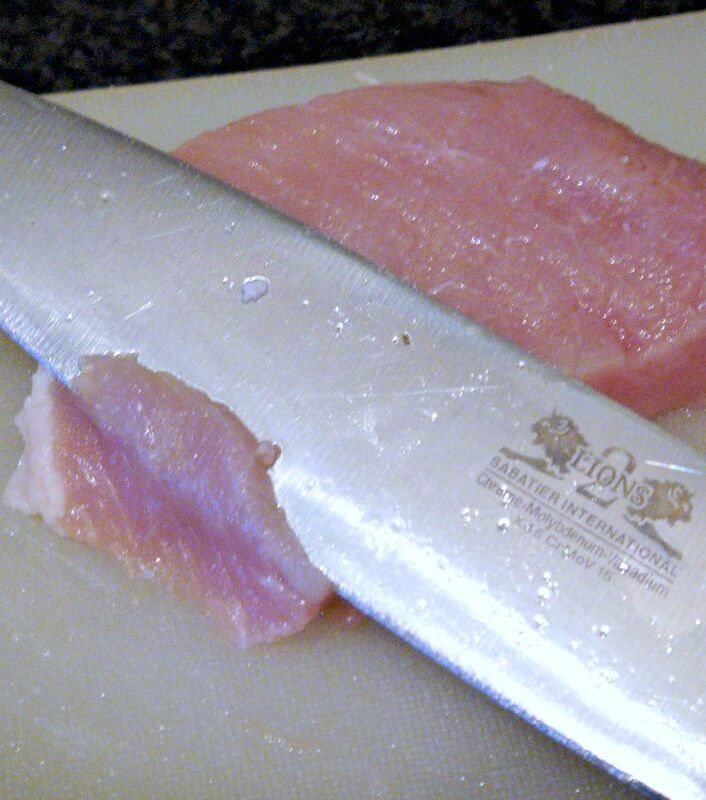 Start by slicing the pork fillet as shown in the photo, in to very thin slices, as thin as possible. 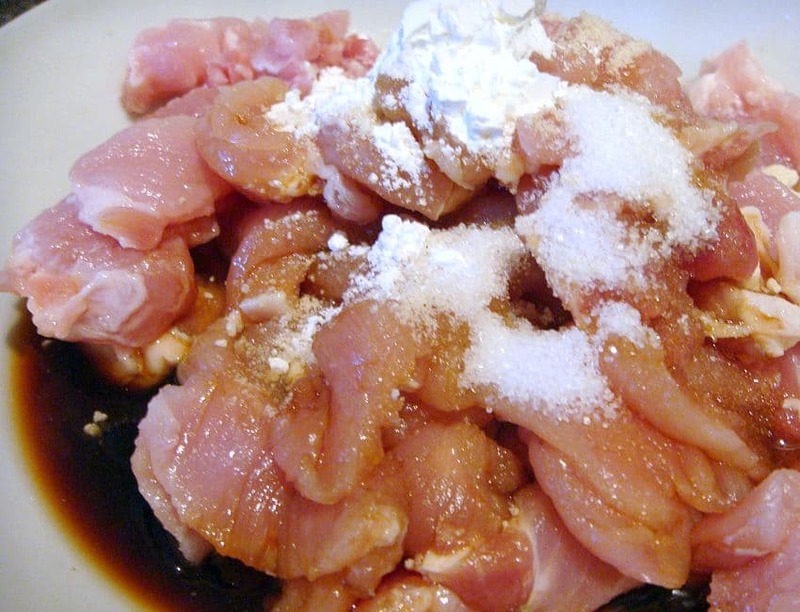 Place in a bowl and add the marinade ingredients to the pork and mix well so everything is combined. Set aside. 2. Chop the scallion and set aside. Wash the Iceberg lettuce and break up with your hands in to manageable pieces. Set aside. 3. Cook the pasta according to the package instructions, then drain and run under cold water to stop from further cooking. 4. At this point, everything is ready and it is just a matter of cooking, which takes 5 – 10 minutes, so do this part just before you’re ready to serve. In a large pan, add the chicken broth and teaspoon of sesame oil and bring to a gentle boil. When it starts to bubble, add the pork and stir so the pork will cook evenly. This will only take a matter of minutes if you have sliced the pork very fine. Take a piece out and check if it is cooked through. You can see in the photo below the pork is not quite cooked, so make sure you check for doneness. 5. Add the cooked pasta to the pork and gently stir so it is all combined, allow to come back to a gentle boil, then in handfulls, add the lettuce. This will soften slightly as you stir it in the soup. Do this until the soup comes back to a boil again, around 1 minute. Then it’s ready! 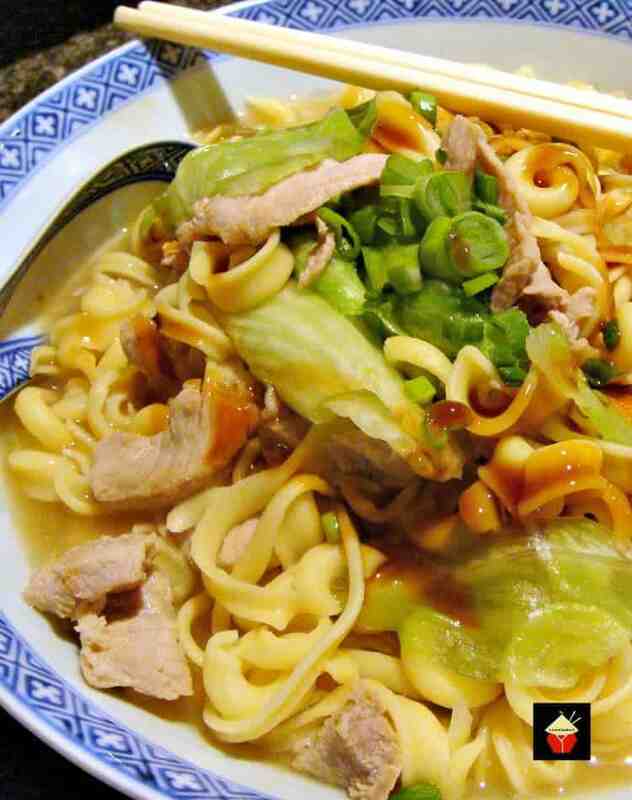 Simply serve in bowls, sprinkle chopped scallions or cilantro and drizzle some oyster sauce, soy sauce or chili sauce over the soup. I usually leave those sauces out on the table so people can help themselves to their own taste. Substitute the pork for chicken, beef or lamb. Use the same marinade and make sure the meat is sliced thinly. Substitute the meat for fresh tofu, cubed. To use this in the above recipe, add the tofu to the marinade and very carefully coat the tofu. It is easy to break so be gentle! Add the tofu right at the very end of the recipe, and cook long enough for it to heat through. For vegetables, you can use bean sprouts, Fresh spinach leaves, Chinese Napa Cabbage (place the thick parts in at the same time as you add the meat and the leafy parts the same time you add the lettuce in the above recipe. Choi Sum, Bok Choi, Sugar Snap Peas. As a guide, anything which does not take too long to cook. 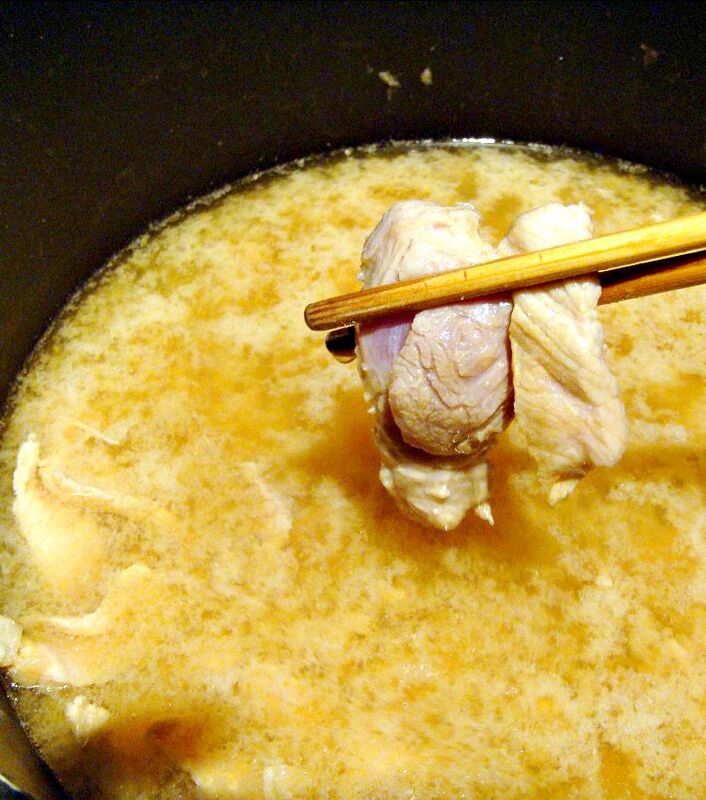 If it is thick, add at the beginning to the broth, when you add the meat. 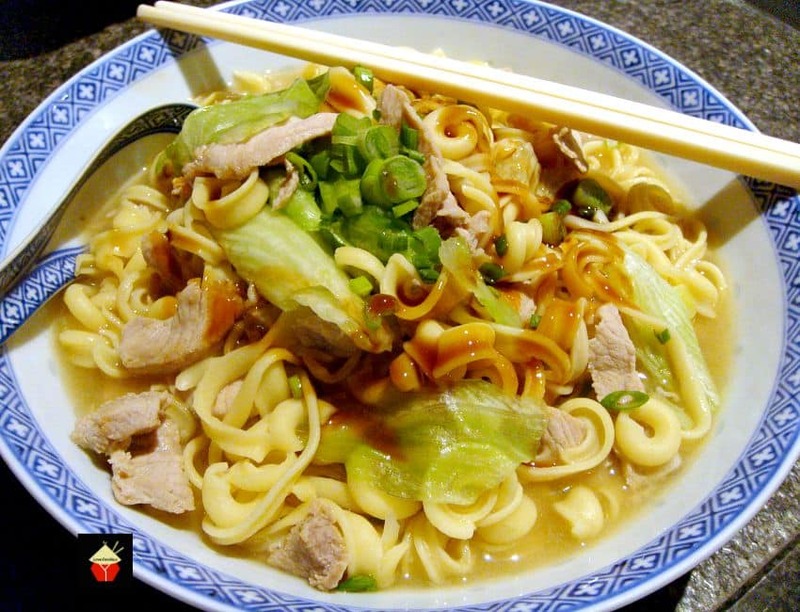 First, as with most Chinese dishes, you need to prepare all the ingredients. Chop the scallion and set aside. 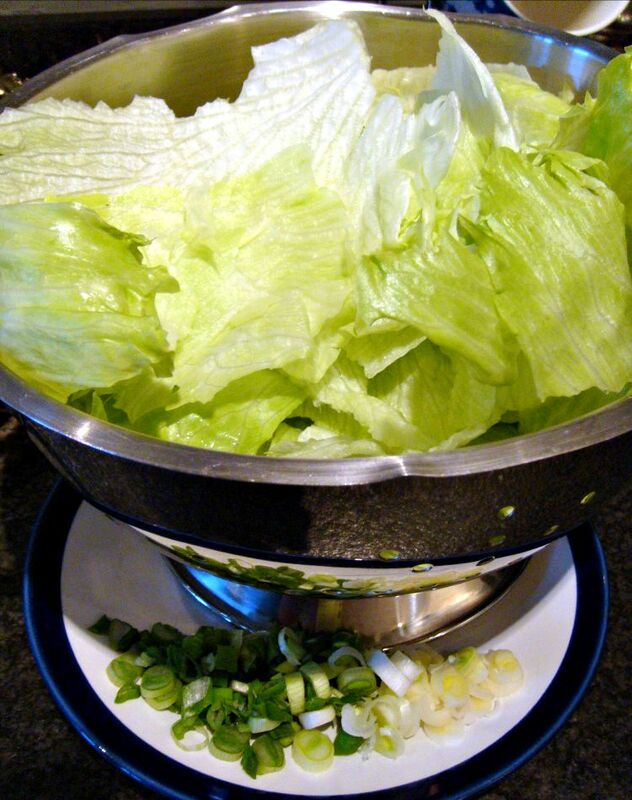 Wash the Iceberg lettuce and break up with your hands in to manageable pieces. Set aside. 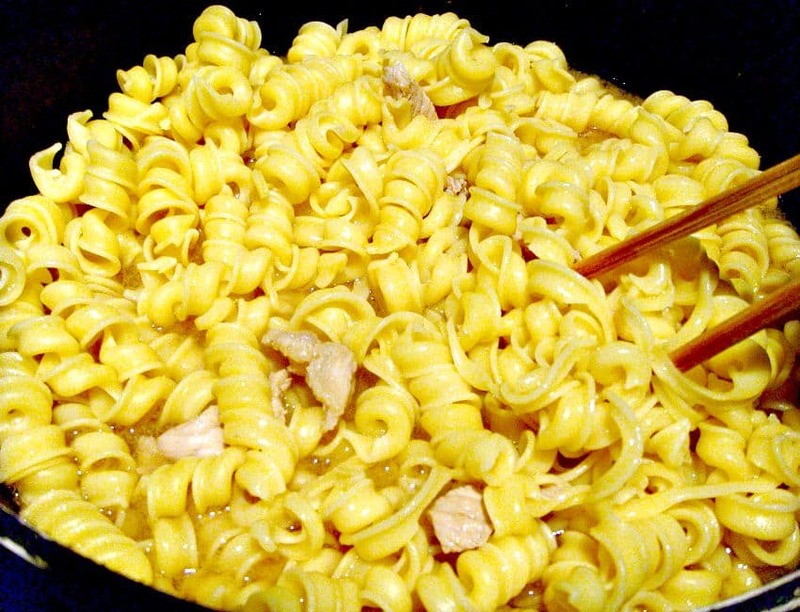 Cook the pasta according to the package instructions, then drain and run under cold water to stop from further cooking. At this point, everything is ready and it is just a matter of cooking, which takes 5 - 10 minutes, so do this part just before you're ready to serve. In a large pan, add the chicken broth and teaspoon of sesame oil and bring to a gentle boil. When it starts to bubble, add the pork and stir so the pork will cook evenly. This will only take a matter of minutes if you have sliced the pork very fine. Take a piece out and check if it is cooked through. 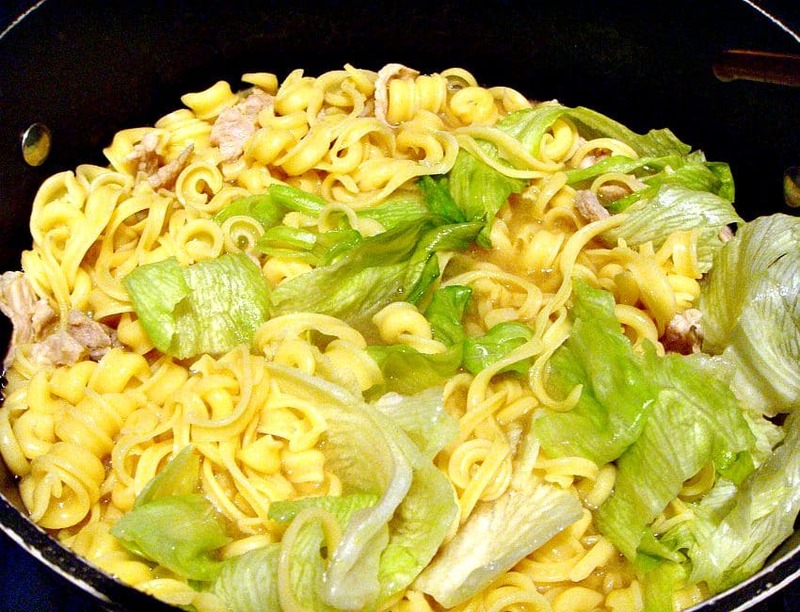 Add the cooked pasta to the pork and gently stir so it is all combined, allow to come back to a gentle boil, then in handfulls, add the lettuce. This will soften slightly as you stir it in the soup. Do this until the soup comes back to a boil again, around 1 minute. Then it's ready!